I own way too many perfumes. A good portion of my “collection” these days is made up of summery, citrus colognes. Here in the chilly, damp Pacific Northwest, and especially after a mega-snowstorm like we experienced last week, I am entering a ‘danger zone’ (a time period when I am REALLY susceptible to buying light, bright citrus-packed fragrances, perfumes that remind me of summer or my years living in Southern California). Who cares that I already own enough sparkling lemon-orange-lime-bergamot-grapefruit-kumquat scents to last a decade; isn’t there room for one, or two, more? Enter Tauer Perfumes Cologne du Maghreb, an all-natural fragrance, that includes notes of bergamot and lemon essential oils, neroli oil, orange blossom, Moroccan cedar wood, cistus ladaniferus, rosemary, lavender, rose and clary sage. I like every fragrance note listed for Cologne du Maghreb and expected to enjoy the perfume, too. Quickly, Cologne du Maghreb shifts and I begin to smell labdanum, a hint of rosemary-sage, and cedar. I’m not unhappy that the rose and orange blossom notes are NOT distinct in Cologne du Maghreb because a dark, rich, “twilight” citrus is what I was hoping for. Were my expectations of enjoyment fulfilled? Yes. For an Eau de Cologne, Maghreb has good lasting power (several hours) and, when it’s first applied, good sillage (it has a way of taking over a room, in a good way; it smells as if you’ve just peeled a fat, juicy, fragrant orange). 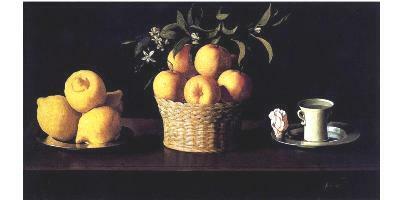 Note: top image, Still-Life with Lemons, Oranges and Rose, 1633, by Francisco de Zurbarán, via Wikimedia Commons. I just had to say… this Zurburan painting is one of my favorite still-lifes of all time. Seeing it just made my day a little bit better. Maybe it is just something about finally being in the firm grasp of winter, but I’ve been on an orange fragrance kick as of late and this sounds really good. The incense-soapy brooding of Orange Star was one I really liked, so an Andy Tauer that emphasizes more of the citrus and less of the amber and the llike would be great. Mandarine Basilic and Orange Sanguine are awesome, but sometimes a heavier, complex and more dense take has a place in my collection as well. AbScent: that’s exactly how I felt…hope you like it. Oh damn. I’d really like a bottle of this and nearly bought one for myself for Xmas. But international shipping from Indiscents is $36, almost half the cost of the fragrance itself. That gives me pause. Is a fair bit to pay for a citrus cologne. Of course if it is a GOOD one then … And so I keep having this conversation with myself. Maybe you can check Tauer Perfumes to compare shipping charges? I think he’s really only selling this one at Indiescents…I don’t see it in his own store. The shipping is killer. I have family in the US who could send it but I really don’t want to blind buy….decisions, decisions! Are you UK or Europe? Australia. I have the same problem with Luckyscent – very expensive shipping. Not that I’m being critical. If that’s what it costs, that’s what it costs. Annemarie: Ouch…$36 is a steep shipping cost. Warum: there are lots…Angie is from the NW too…down the road a’ways in Portland. Warum…SHOULD have said ANGELA here at NST…. Kevin, yep, both Angie and Angela. Marjorie Rose too. Very cool! I like overripe fruit perfumes– is there any similarity to Diorella? I find the opening of AT’s perfumes the most challenging, a little high-pitched for me, though I love Eau d’Epices. I wish he would sell this from his own site, but maybe he will in the near future. I love colognes and I like quite a few of the Tauers. But glad to read such a positive review of this, thanks. I was lucky enough to win a bottle of this in Andy’s 2010 Christmas Advent event but I ended up re-homing my bottle. I just didn’t last on me at all plus I’m not much of a citrus (not that I got much citrus from it, I found it more woody/incense-y?) cologne fan, anyway. In fact, the only cologne that I’ve genuinely liked so far is Institut Très Bien’s Cologne a la Russe and typically it appears that it’s finally been axed if ITB website is anything to go by! Abyss – I agree with you about the woody part. I received a small decant in a swap this summer and found it – well, interesting. Still on the fence about it. I actually got citrus, pineapple, and wood. Will keep trying, though – Andy’s fragrances are never boring. I had the good fortune to try a sample of this last year and I’m *really* glad Andy decided to add it to his line. I thought it was a wonderful and odd mixture of a citrus cologne with this cozy incense aspect to it. I think this a great addition to the Tauer offerings! I’m not a citrus fan, still less a cologne fan… but so glad to see you liked it. Andy rocks. Fragrant Witch: you are welcome (I guess!) HA! and it’s one of Andy’s more affordable offerings, too! Kevin, how would this compare to my reigning cologne favorite, Eau de Rochas? I like Eau de Rochas so much because it’s an excellent citrus with a woody/spicy patchouli, which (to me) verges on “dusky, rich, twilight” citrus cologne territory (though via a different route than in Maghreb). Angela made a great observation in her Eau de Rochas review that whereas many citrus colognes seem to assume you’re off to hit the tennis courts or engage in some other perspiration-inducing endeavor, Eau de Rochas would be more suitable for lounging around the porch with a book. Is something of the same true of Cologne du Maghreb? Emily: if memory serves…Maghreb is darker than Eau de Rochas…now, the lasting power…it’s been too long since I’ve worn the Rochas to give a good answer on that. If Angie had Rochas reading on the front porch I’ll take the liberty of having Maghreb in the music room practicing Satie, even Debussy, on the piano. (Maghreb is more “indoor-sy” if that makes sense. I was lucky enough to win a bottle of this in Andy’s Christmas draw, which really cheered me up after a rubbish day. Great review, this cologne is a bit of a chameleon. On me there is a refreshing blast of citrus, mostly lemon, in the opening (I love citrus). It then transforms into a woody skin scent with the cedar prominent, which lasts for a couple of hours. I have used this cologne to wake up my tired brain, when it must be active – which it does admirably. I don’t think I would spray it to read a book to relax, but C de M is a great wake-up call. Sunset: funny, I’d spray it on the sheets before going to bed to relax myself! Well, that explains it! I’m not a citrus fan – think Hermes Concentree d’Orange Verte is the only citrus scent I own now – but I recently read up on the Arquistes and found myself drawn to L’Etrog, which Octavian compares to the original AG Eau d’Hadrien (my very first niche perfume). It’s so funny to realize that one can really crave citrus in the winter rather than the summer. And that citrus PdE orange chypre Azemour is also calling my name. My credit cards are begging me to try this one instead! I’m curious on which one you’ll chose…please post when you do! I try to buy a 2.5 or 5-ml decant before I go FB, but I sometimes break that rule when the reviews are great. Thanks for the cautionary note! Noz: PS, the L’Etrog doesn’t remind me of Eau d’Hadrien at all, more like one of the Hermes “Jardin” scents (citrus-tea). Nice, but not worth $165! Kevin, you describe Maghreb well. I’m another one of those lucky winners–and especially lucky because this is the first of Andy’s scents that I really liked! I love citrus and “art studio” smells, maybe because I’m an artist. But I also agree with those who wrote here that it’s a chameleon, which seems to be a characteristic of natural perfumes. I get a lot of lime in the opening–maybe it’s just that green colored juice! There’s spice and incense and amazingly, he’s able to keep the citrus going for a long time. I too love citrus, but don’t use it to ofset my local climate (wet, windy and grey), I only like them when I’m somewhere sunny. The pathetic fallacy of perfume perhaps. I think Tauer’s Une Rose Chypree suits my climate especially when it rains for days on end. Anna: thanks. I’m taking out my summer perfumes early this year…I’m giving gallery talks on a Gauguin exhibit and want to exude “tropics.” HA! Kevin, which gallery talk(s)? I’m a SAM member (looking forward to the exhibition) AND I just received my bottle of Maghreb from Robin in the post today. (I was one of the two lucky winners in last month’s draw.) I’m also friends with Christen at knows perfume; she was simply beside herself with joy when you paid her a visit. I’m planning a sniffing visit with her soon, and will bring the Tauer and the OJ Discovery Set I got for Christmas. Ah, so many scents, so few hours in which to douse myself in them…Anyway, I LOVED being able to read your wonderful review just moments after I sprayed my arm! I have Songes. I totally associate that with Gaugin. I often match my perfume to exhibitions I visit, if I can. It adds an additional dimension. I hope that doesn’t sound too silly. Luckyscent now has samples. I am not a fan of his creosote-base, it reminds me of setting fenceposts, which is not a perfumey thing for me. And cedar doesn’t really work on me, either. But still, I’m a citrus freak (hey, I live in Phoenix, and summers are long), so I’m giving it a try.